Kathryn J. Synor is now ranked Top 10 Under 40 attorney for excellence in the field of Family Law for 2014! 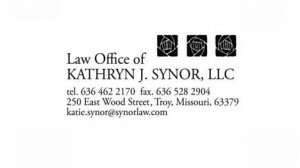 Kathryn J. Synor of the Law Office of Kathryn J. Synor, LLC has been selected by the National Academy of Family Law Attorneys as nationally ranked Top 10 Under 40 attorney for excellence in the field of Family Law for 2014. The National Academy of Family Law Attorneys is a professional organization that is dedicated to helping the public find the most premier family law attorneys in the nation. By providing the public with the most accurate, up-to-date listings of top ranked attorneys in their states, the NAFLA helps ensure quality representation for those in need of a family law attorney. •	The attorneys who make the NAFLA list must first be nominated by a licensed practicing attorney. •	Second, the NAFLA research staff verifies the nominated individuals meet the minimum requirements of membership in the NAFLA. •	The NAFLA processing committee selects a portion of the nominated attorneys to advance to the final selection stage. •	Finally, the NAFLA Board of Governors officially selects the top family law attorneys in each state. In addition to family law matters such as adoption, divorce and child support and custody modifications, Ms. Synor also dedicates a large portion of her practice to estate planning and probate law, landlord/tenant issues and collections. Attorney Kathryn J. Synor can be reached at 636-462-2170 or at 250 E. Wood St. in Troy.